For the second year running, Aer Lingus has been recognised in TripAdvisor’s Travellers’ Choice awards for airlines. Following the success of last year’s inaugural Travellers’ Choice awards for airlines, the 2018 awards again recognise airlines that provide exceptional value and service across the world. This year, the awards also recognised top airlines in four distinct service classes: International First Class, Business Class, Premium Economy and Economy. 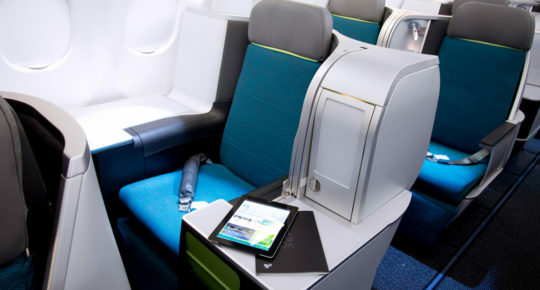 Based on reviews from TripAdvisor travellers, Aer Lingus has been selected as a winner in the Business Class category. According to TripAdvisor, the hallmarks of Travellers’ Choice award winners are outstanding service, quality and value. 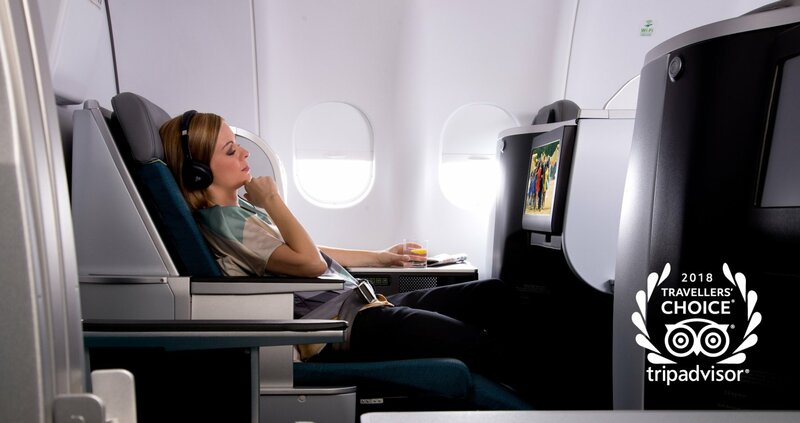 We operate a Business Class service on board all of our transatlantic flights. Business Class offers guests a unique space on board, which can be tailored to meet individual needs. The space can be adapted depending on whether you want to sleep, work, dine or simply relax. This is largely facilitated by a custom-designed seat that converts into a full-flat bed. Owing to the popularity of Business Class in prior years, in 2015 we increased the number of Business Class seats on our long-haul fleet. The central element of our Business Class experience is the “Vantage” seat, manufactured by Northern Ireland-based company Thompson Aero. The bespoke full-flat seat delivers the possibility of sound sleep, allowing guests to arrive at their destination 100 percent rested and ready to go. The seat transforms into a fully-flat 6’6’’ (2 metre) bed, at a width of 22 inches. This makes it one of the longest in the industry. 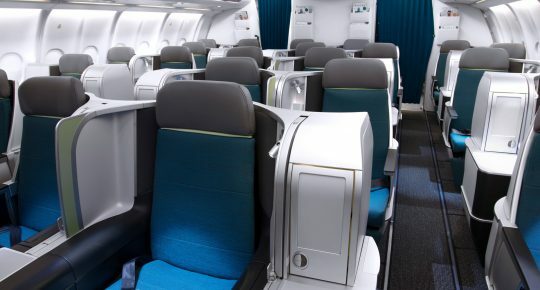 The Business Class cabin has been designed to give 90 percent of the seats direct aisle access, providing greater privacy and the ability to get in and out of seats with ease. 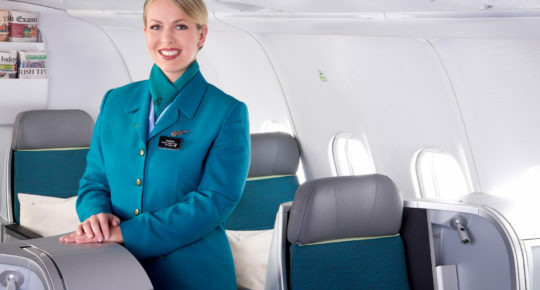 Irish supplier Botany Weaving, based in Cork Street in Dublin, provides the fabrics for the Business Class cabin including seat covers, carpets and curtains – all beautifully designed in vibrant fibres to reflect our Irish weaving heritage. Flying Business Class redefines how you think about work when crossing the Atlantic. Guests can stay connected in-flight, with complimentary Wi-Fi and mobile network coverage that allows guests to send and receive texts and data. The cabin has built-in power points with universal sockets and USB power outlets, alongside ample workspace. Storage has been increased to allow for tablets to be stored under the personal monitor and laptops can be stored in specially designed storage space. Pockets for phones are within easy reach and work lights with a dimming feature are standard on all seats. Our commitment to Irish suppliers is evident across our Business Class menu. The menu features signature dishes from across the four provinces of Ireland. Seasonally driven, the menu changes four times yearly using the finest Irish ingredients to guarantee freshness and quality – reflecting a fusion of the best of modern Ireland. A pre-dine service is available on selected overnight flights. This service facilitates guests who wish to sleep for the duration of the flight, meaning that as soon as the seat-belt sign goes off, the customer can convert their seat into a fully flat-bed for sleep. Business Class guests enjoy the very best that in-flight entertainment has to offer, on personal multi-touch 16’’ high definition monitors. Additional content is available here, adding 50 percent more new-release movies, and 100 percent more TV content. The offering includes new release movies, classic movies and over 60 hours of TV. New games are featured on the in-flight entertainment system and exclusive HD games are available in the business cabin. The Panasonic ex2 system features remote control and touch screen capabilities, an intuitive system that can now be experienced in high definition. This system is available gate-to-gate so customers can start watching as soon as they board. There is a massage function in the seat for extra comfort. The Business Class experience extends to priority check-in, enabling seamless airport navigation and greater efficiency and speed. Fast Track security is available at all U.S. airports and at Dublin and Shannon airports. All parts of the U.S. Customs and Border Protection pre-clearance process are completed at Dublin and Shannon airports in one quick and easy procedure. A further benefit is in use of AerClub lounges in Dublin, London Heathrow, Boston and JFK. Business Class guests are also invited to board the aircraft at their leisure and will be welcomed with champagne, signature cocktails or orange juice. On arrival in Dublin, Business Class guests can avail of an exclusive Revival Lounge with a dedicated area to shower and steam clothes. Flights are on sale with lead in fares starting from €899 each way including taxes and charges.